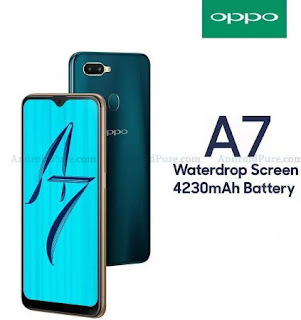 Oppo's low budget phone, the A7's latest posters has been leaked with specifications.Oppo A7 will be a rebranded version of Realme smartphone, which was released in India a few months ago with 3GB RAM and 32GB internal storage. Oppo A7 will have 6.2 inch display with HD+ resolution and density of 271 ppi.It has 89.35% screen to body ratio and 19:9 aspect ratio with water drop notch on its top of display.For protection it has Gorilla Glass 3 as well.It has dual camera module with 13MP+2MP sensor at rear and 16MP single shooter it it's front.Its front snapper will also works as face recognition sensor for face unlocking. Inside the phone,it has 1.8 GHz Snapdragon 450 octa core processor with 3GB/4GB RAM will be powering up the phone.Besides,it has 32GB and 64GB onboard storage along with expandable storage up to 256GB via micro sd card.The handset will have 4230 mah rechargeable battery.Usual connectivities like GPS/GLONASS,Wifi ,Wifi hotspot,Bluetooth and 3.5 audio jack will be available with this phone.It will be pre installed with finger print sensor,proximity sensor,gyroscope and light sensor. As of writing this,there is no confirmation about its releases date as well as pricing.It will be updated here when trusted datas are available.